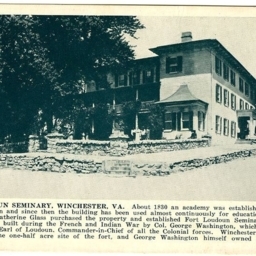 Fort Loudoun Seminary, Winchester, VA.
Postcard with a picture of the Fort Loudoun Seminary building located at the site of a revolutionary fort. The card includes a description of the building and the site's history. 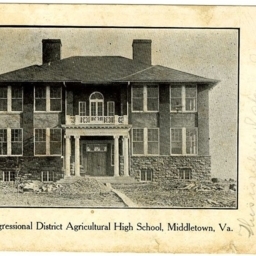 Seventh Congressional District Agricultural High School, Middletown, Va.
Postcard with a picture of the former Middletown School building when it was used as an Agricultural High School. 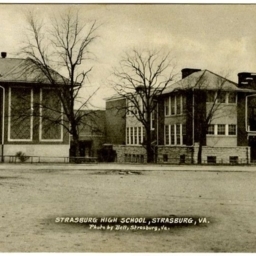 Strasburg High School, Strasburg, VA.
Postcard with a picture of the Strasburg High School building. 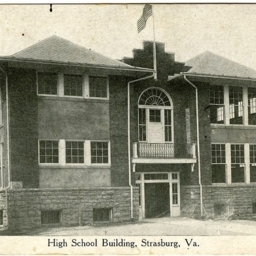 High School Building, Strasburg Va.
Postcard showing a picture of the High School in Strasburg Virginia. 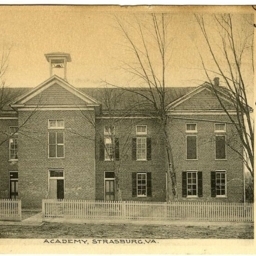 Postcard with a picture of the Academy building in Strasburg Virginia. 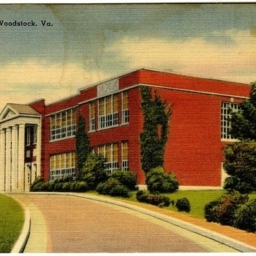 Color postcard showing the school building on the north end of Woodstock. 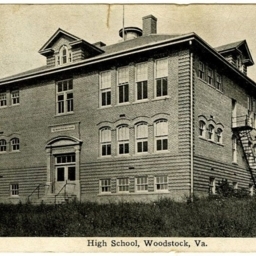 Public School Building, Woodstock, VA.
Postcard with a picture of the school building in Woodstock Virginia. This structure once sat at the same position as the Woodstock Post office but was moved when that building was constructed. 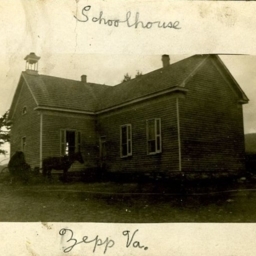 Postcard showing a picture of the school located on Court Street in Woodstock Virginia. 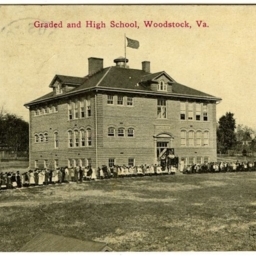 Postcard with a picture of the Woodstock School located on Court Street. 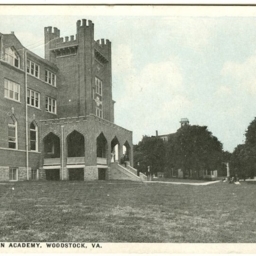 Massanutten Academy (Lantz Hall in Foreground) Woodstock, VA.
Postcard with a picture of the central portion of Massanutten Academy, now military academy. 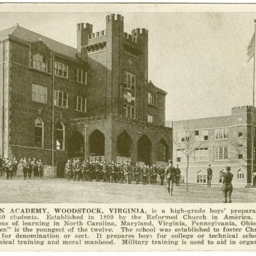 Postcard with a picture the Massanutten Academy, now military academy, with cadets assembled in front of the building. 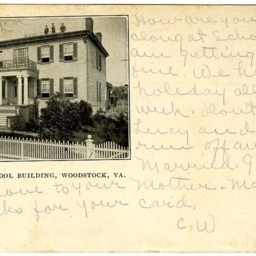 The card includes a description of the school. 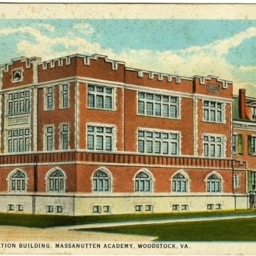 Massanutten Academy, Woodstock, Va., formerly residence of US Senator H.H. 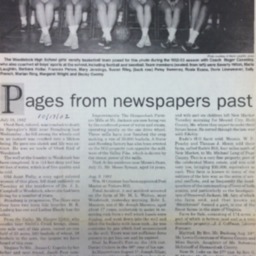 Riddleberger. 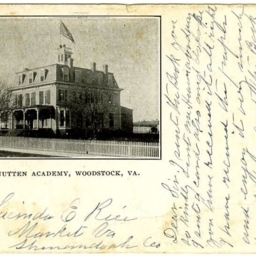 Postcard with a picture of what is now Riddleberger Hall at Massanutten Military Academy. 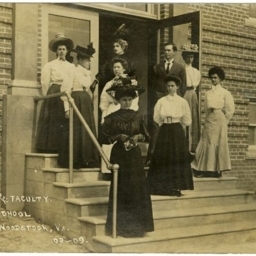 At the time it was the only building of the Massanutten Academy. 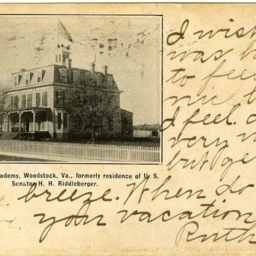 Postcard with a picture of what is now Riddleberger Hall at Massanutten Military Academy. 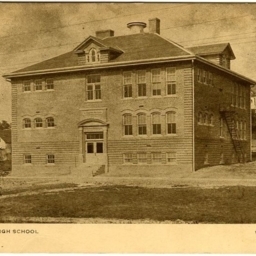 At the time, it was the only building of what was called the Massanutten Academy. 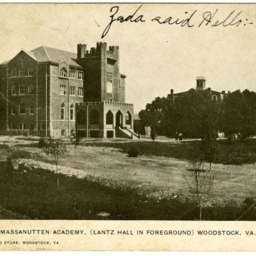 Postcard with a picture of Lantz and Riddleburger Halls at Massanutten Academy (now Massanutten Military Academy) in Woodstock Virginia. 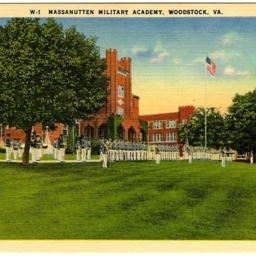 Massanutten Military Academy, Woodstock, VA.
Postcard with a picture of cadets in front of the central campus of Massanutten Military Academy in Woodstock Virginia. 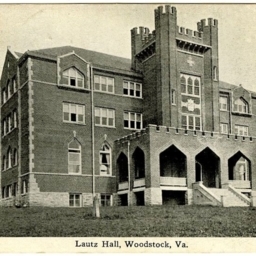 Postcard with a picture of Massanutten Military Academy's Lantz Hall located in Woodstock Virginia. 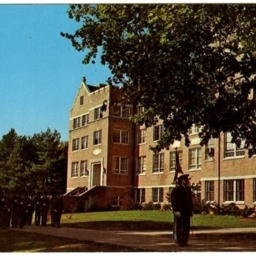 Color postcard with a picture of Massanutten Military Academy's Harrison and Lantz Halls in Woodstock Virginia. 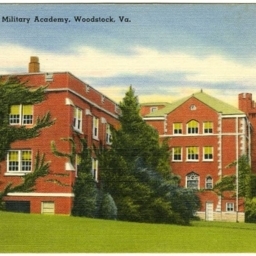 Color postcard with a picture of Benchoff Hall and cadets at Massanutten Military Academy in Woodstock Virginia. 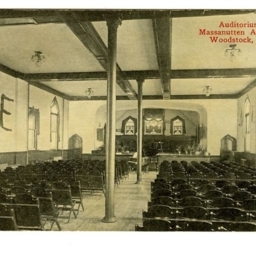 Auditorium, Massanutten Academy, Woodstock, Va.
Postcard with a picture showing the interior of Massanutten Academy's (now Massanutten Military Academy) auditorium located in Lantz Hall. 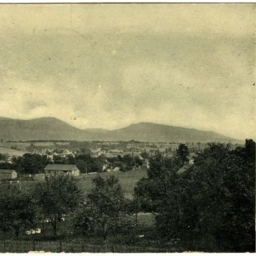 View showing Massanutten Academy and Mountains, Woodstock, Va.
Postcard with a picture of Massanutten Academy (now Massanutten Military Academy) and the mountains in Woodstock Virginia.